Your brain's limbic system is why the use of aromatherapy for the emotions can help relieve unwanted emotions and promote desired ones. As soon as the molecules of a scent bind to the olfactory receptors in your nose, stimuli travel from the receptors to the olfactory bulb in the limbic system. That system is largely responsible for your emotional responses. The molecular structure of an essential oil is important in how that oil affects emotions. For example, the aldehydes and esters in some essential oils are calming and sedating, while other oils contain invigorating components. The emotional effects of aromatherapy also vary from person to person based on a person's physiology and emotional connections to specific scents. Because people respond differently, the following suggestions are only a place to start. The most effective use of aromatherapy for emotions comes through tailoring the use of essential oils to your individual needs. Another view of aromatherapy for the emotions comes from the psychological aspects of yin and yang in Traditional Chinese Medicine (TCM). Gabriel Mojay, in Aromatherapy for Healing the Spirit: Restoring Emotional and Mental Balance with Essential Oils, makes the following essential oil recommendations for relieving unwanted emotions. Note: Diffuse the essential oils or mix them with one tablespoon carrier oil for a massage or bath. Also see suggestions for aromatherapy for depression. Use the blend to massage your solar plexus and lower back every morning or as needed. Do not use this aromatherapy blend at night, as it's likely to keep you awake. Add the blend to one ounce (30 ml or 2 tablespoons) massage oil for a massage, use a few drops in your bath, or diffuse a few drops. 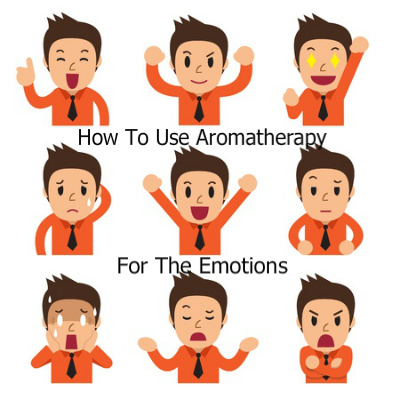 Experiment with using aromatherapy for the emotions and have fun!